I buy books when I am stressed. I also buy books when I am bored. And when I am happy. And when I am...well you get the idea. I buy books. I buy books a lot. I have been trying to cut back but I gave that up as a lost cause as you will see when I list all the books I have gotten lately. In my defense, I am feeling less stressed, bored, and unhappy after all these purchases. Why mess with what works, right? 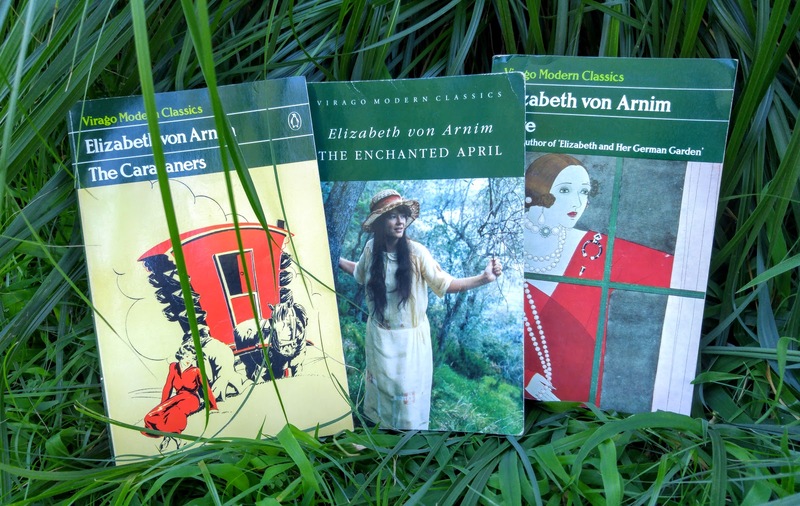 I saw a review of Love by Elizabeth von Arnim on Heavenali's blog. I have read a number of Elizabeth von Arnim's books but I have never heard of this. Obviously, that meant I had to buy it immediately. I also ordered a copy of The Caravaners, which I have heard of but haven't read, and a copy of The Enchanted April, which I love. I have it on my Kindle but if I love a book I want to own a physical copy. I have written about The Enchanted April before in this post. I bought two biographies. Both were recommended to me after I read Claire Tomalin's biography of Jane Austen. Unfortunately, I can't remember who recommended them. I need to keep better track of these things. The first is Samuel Pepys--the Unequalled Self which is also by Claire Tomalin. I once tried to read Pepys diaries when I was a teenager and gave up on them. I didn't have the patience to wade through the old-fashioned language and boring bits (or what I found to be boring bits as a teenager) in order to read the passages I liked. Maybe this will just give me all the good bits. Whoever suggested it to me described it as fascinating so I have high hopes. 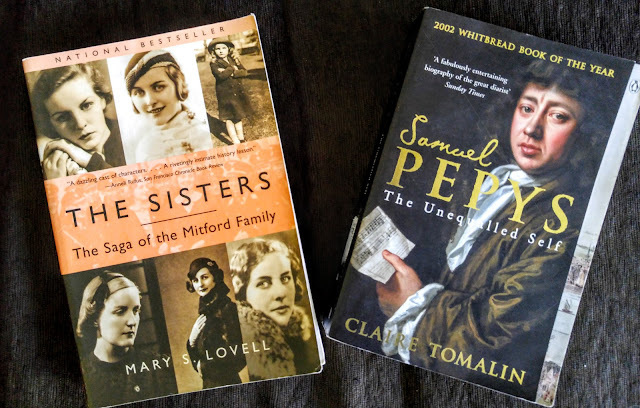 I also picked up The Sisters--The Saga of the Mitford Family by Mary S. Lovell. I got it at the library for fifty cents. I always have this compulsion to mention just what a bargain some books are, I don't know why. Anyway, I think someone on Instagram recommended this. I keep meaning to read more of the Mitfords. Now I have the opportunity. I bought three more books about Britain during WWII. My fascination with the time period seems in no danger of flagging. The first is The Secret Life of Bletchley Park by Sinclar McKay. I visited Bletchley Park when we were in England in April and I found it very interesting. I read a book about the actual code breaking but I wanted to know more about what life was like for the people who lived there. I am hoping this book will tell me more about their day-to-day life. I also bought Living Through the Blitz by Tom Harrisson. Harrisson was a co-founder of the Mass-Observation organization. Many of the diary compilations I read are put together from information gathered by Mass-Observation. I am looking forward to reading a book by the man who helped start gathering social history of the time period. 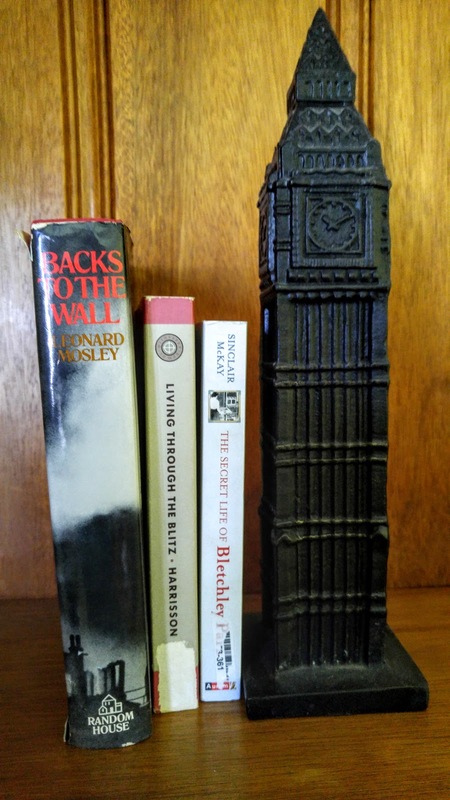 The third book is Backs to the Wall--The Heroic Story of the People of London during World War II by Leonard Mosley. This is basically self-explanatory. It is the story of British people during the war, I am going to read it. Lastly, I bought King Hereafter by Dorothy Dunnett. I finished the Lymond Chronicles and that left me with a Dunnett shaped hole in my reading life. I wasn't sure I was ready to commit to her other series so I bought this. 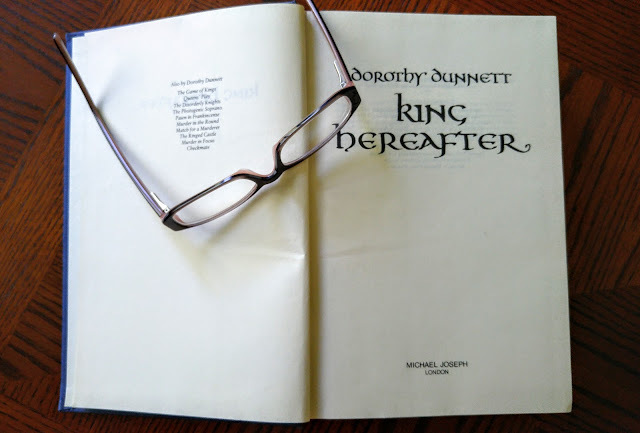 It is a stand-alone novel and apparently Dunnett viewed it as some of her finest writing. If it is anything like the Lymond Chronicles I will spend the first third of the book slightly baffled, the middle third resisting the urge to start over so I can pick up the pieces I missed, and the final third galloping toward the conclusion missing sleep in the process. There you have the nine books I bought recently. Oh my, nine. Let's just concentrate on the fact that I am not bored and that the sight of these books is immensely cheering. Why couldn't I be the type of person who cleaned her house when she was stressed? Or exercised? But then I wouldn't have a stack of beautiful books to look forward to. So yes, comfort me with books. When I saw the Leonard Mosley book, I wondered if he was related to Oswald Mosley, which would be an interesting connection to the book on the Mitford sisters - who fascinate me. Have you read the big book of their collected letters, edited by Diana's daughter-in-law Charlotte Mosley? No, I haven't read that. I debated whether to order it and I am sure I will at some point. I enjoy reading collections of letters. I also am considering buying the collection of letters between Winston Churchill and his wife. I buy books to feel happy too. Hope you enjoy Love. I haven't read The Caravan ers yet. That Mary Lovell book about the Mitford is fantastic. I am going away for a few days and am taking The Caravaners with me. I'm looking forward to reading it. Several people have told me how good the book about the Mitford sisters is. Maybe I should take that with me too. I buy books for all the same reasons as you do! I also have The Caravaners unread but will get to it one day as I enjoyed Love & Enchamted April. Also loved Tomalin's Pepys (all her biographies actually) & spent a lovely winter a few years ago reading the Shorter Pepys (1000+pages!) which was wonderful. I hope Tomalin inspires you to give him another go. I read King Hereafter many years ago but remember enjoying it. Also the Mitford biography & their letters so I second that recommendation, also the Churchill letters which I listened to on audio read by Michael Jayston & Eleanor Bron. Just discovered your blog (because you followed me on Twitter, thank you) & I can see we're kindred spirits already! We do seem to like a lot of the same books. I actually have been reading your blog for a while now but only just found you on Twitter. I probably will give Pepys another try. I am hoping the biography will inspire me to do so. I almost ordered the Mitford letters and am sure I will cave and do so shortly.